Corey Rosen Schwartz, author of the popular Ninja Red Riding Hood, and Rebecca J. Gomez have teamed for a truly energetic rhyming tale about teamwork and one bossy moose who just may ruin his friends’ plans for building a beautiful treehouse. Yamaguchi’s adorable and lovely illustrations are a beautiful accompaniment to the authors’ romping rhymes. One aspect of the story that I particularly appreciate is that is it is ever subtle with its message about learning to work as a team- and how we can deal with someone- even well-meaning- who is bombastic and bossy. 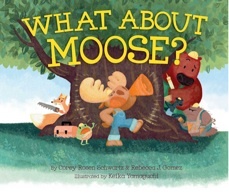 What About Moose?, with its lilting and clever rhymes, winning illustrations, and gentle message, is perfect for a preschool and up storytime crowd. In my experience, kids always like a story where they can chime in, and the refrain of “But what about you, Moose?” is an additional fun element of this read aloud. Any readers with experience of a know-it-all sibling or bossy friend will surely be able to relate to this story! Bonus: The lovely Corey Rosen Schwartz herself has passed along a craft idea as well: kids can create some moose antlers to go along with the story, if you want to organize a craft and storytime session (or just have fun at home!). I had been reading and hearing great things about The Snatchabook since it was published, but only recently got around to reading it! The Snatchabook is a warm and really beautifully illustrated tale that captures the joy and wonder of books. A bunny named Eliza Brown, who lives in a place called Burrow Down, is shocked to learn of books going missing in her town. 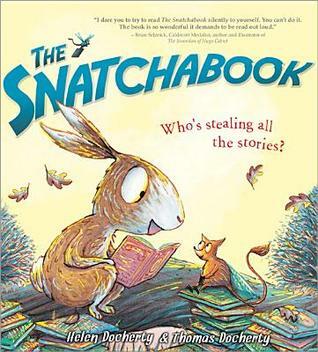 She sets out to catch the book thief and is surprised when she meets the little (and beyond cute) Snatchabook creature, and learns why they have been stealing books. Thomas Docherty’s illustrations are inviting, detailed and oh so irresistible. While on the longer slightly side for a rhyming read aloud (along the lines of The Highway Rat or Tabby McTat), children will likely be unable to resist such an enthusiastic, happily ending read. With its theme of book love and the importance of a bedtime read, The Snatchabook also makes for a perfect goodnight book. 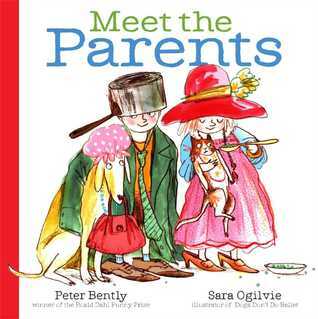 This picture book, from Peter Bently and Sara Ogilvie, is an unexpected treat! Written in rhyming text, the very funny and lovingly affectionate Meet the Parents is an ode to the (mostly all!) amazing things of parents, as told from the point of view of children. While we are told that it can seem as though parents are only there to “nag and boss you like mad”, we’re assured that there are a wonderful amount of things that parents do- things that we would be lost without. For example, parents “sort out all your messes and muddles….give cuddles… parents tell stories and tuck you up tight, as snug as a big in a rug every night…”. The icing on this delightful picture book are, for me, the vibrant, colourful and wonderfully expressive illustrations from Ogilvie, which work seamlessly with Bently’s funny text. This picture book would make for a fun curl-up and read together, as well as a giggly storytime read aloud for toddlers and up. *Digital galley was received courtesy of the author. Opinions and comments regarding the title are my own. Thank you for the lovely review of WHAT ABOUT MOOSE? !